The town of Daraz has witnessed an angry revolutionary demonstration, in condemnation of the rules of al-Khalifa lawless judiciary. In an angry wave of protests sweeping the regions of Bahrain in condemnation of the unjust rule issued by the corrupt judiciary on His Eminence Sheikh, Mujahid Ali Salman, a crowd of resistance people in the town of Daraz has participated on Sunday (November. 4) in an angry revolutionary demonstration. 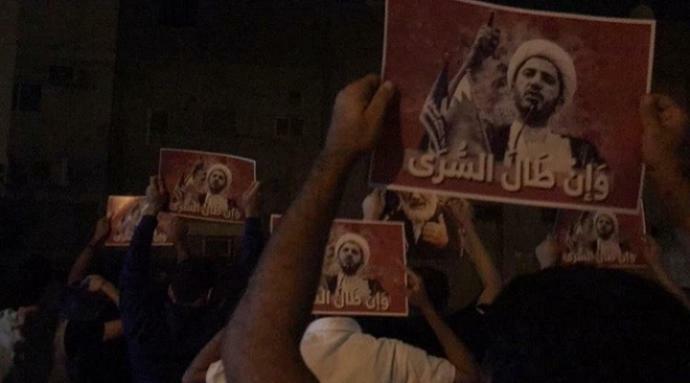 Through slogans and banners, they expressed their solidarity with His Eminence, the Sheikh. In conjunction with this revolutionary movement, the occupation gangs closed the roundabout in the town of Diraz, continuing the systematic campaign of terrorism.